A policy of deception and denial is the cornerstone of Russia‘s overarching strategy of confusion, paralysis and ultimately defeat of the opponent. How can Armenia’s geopolitical context contribute to stability in its immediate vicinity and in NATO’s Southern Neighbourhood? US attempts to change the provisions of the nuclear deal with Iran will intensify over the next months, but things are only likely to come to a head in 2019. The Afrin events are being used to assert the notion that without Russian military guarantees, and a Russian military base deployed in Armenia, Yerevan will be under a constant threat from a potential Turkish offensive. There is uncertainty in Iraq's Kurdish Region after President Barzani's independence gamble misfires. 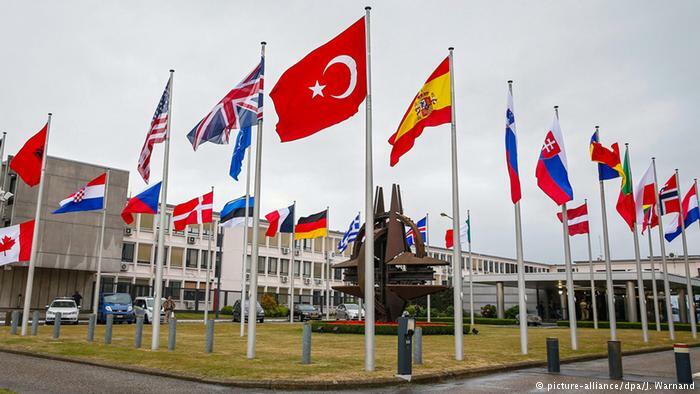 Turkey's decision to buy Russia's S-400 missile defence system opens a new stage in relations between the two countries. Armenia did not turn up for a NATO military exercise in Georgia as was expected. The most probable reason may be the attempt of Yerevan to avoid jeopardizing its strategic alliance with Russia. Armenian and Azerbaijani societies continue to prepare for war despite the prospect of a presidential summit in the autumn. The best-case scenario is a continuation of low intensity conflict along the line of contact. An Armenian general is now at the helm of the CSTO military alliance. This may prove to be a double edged sword for Armenia. Military environment in the Mediterranean is changing according to the chess plans of Russia’s leader Vladimir Putin. After bridging the immense opposition Russia was encountering during and after the demise of the USSR, a new Russian influence sphere has been built up of unforeseen order. It how the situation is perceived by Western leaders and military experts. EGF is excited to announce the launch of a new monthly information product, the Geopolitical Trends. Written by our long-time Head of Research, George Vlad Niculescu, it aims to fill a gap in complex, multi-optional coverage of key geopolitical trends in Eurasia. Each issue will delve deeply into current events, such as recent Russian/American actions in Syria and implications for the ongoing conflict in Ukraine. On 6-8 November, 2014, the PfPC and the Austrian National Defense Academy jointly organized the 10th Workshop of the RSSC SG at “Schloss Rothschild” in Reichenau (Austria). This workshop offered a platform for constructive dialogue among government and academic experts on the prospective roles of the EU and the Eurasian Economic Union (EEU) in breaking the current deadlocks in the resolution of the protracted conflicts in Abkhazia, South Ossetia and Nagorno-Karabakh. During this workshop, a panel moderated by George Niculescu, the Head of Research of EGF, examined the background and the potential implications from the perspectives of South Caucasus (SC) states of having to make undesirable choices between the EU and the EEU. The panelists’ presentations and the ensuing discussion highlighted that, against the backdrop of the Ukrainian crisis, maintaining freedom of choice on the ways and levels of engagement with both the EU and the EEU is a critical interest for each SC state, and a prerequisite for effective conflict resolution. In this context, Mr Niculescu thought that “the EU might work towards developing options for harmonizing the European and Eurasian integration normative systems. One of the options to be explored might involve sustaining post-conflict regional economic cooperation as a way to circumvent the dilemma of the states caught in-between competing European and Eurasian integration processes.” READ MORE. Please see the relevant post on Facebook here. On 07-09 November 2013, Mr. George Niculescu, the Head of Research of the European Geopolitical Forum, attended the 8th Workshop of the PfP Consortium Study Group “Regional Stability in the South Caucasus”, held in Reichenau (Austria). Mr. Niculescu moderated the panel on “Alternative Models of Sovereignty in Practice” aiming to propose practical solutions for “joint political and administrative” governance in the South Caucasus. Distinguished panelists from Armenia, Azerbaijan, Germany and the United Kingdom put forward their thoughts on the subject, while the audience consisting of officials and experts from regional and international think tanks, education institutions, and civil society actively debated panelists’ proposals. Mr. Niculescu concluded that: “Rather than trying to impose unilateral solutions involving the final status of the unrecognized political entities in the South Caucasus, regional states and relevant international actors should rather focus creative energies on setting up transitional processes aimed at achieving multilateral governance over the regional commons. Moreover, as suggested by lessons learned in the Western Balkans, region building strategies should effectively complement international efforts for conflict transformation. However, a champion for regional integration is still missing in the South Caucasus. Potentially, the EU could revitalize its involvement in strengthening regionalism in the South Caucasus in strategic coordination with Russia and Turkey“. Click here to see an outline of the workshop and here to see the ensuing policy recommendations. On November 21st, 2012, a surprising announcement was made in Vienna. Mongolia had acceded as the 57th participating State of the Organization for Security and Cooperation in Europe (OSCE), the world’s largest regional security organization. Mongolia has effectively been an observer state since 2004, involved in the OSCE’s Asian Partners for Cooperation together with Japan, South Korea, Thailand, and Afghanistan. Contributing to the surprise of the announcement, the country’s bid for full participation in the work of the OSCE had only come in late October 2011, when the Lithuanian Chairmanship received a formal letter from the Mongolian government stating their willingness to comply fully with the terms of the Helsinki Final Act, the Charter of Paris for a New Europe, and other documents integral to the OSCE. Click here to read more. Since the outbreak of initial hostilities in November 1990, the Transnistrian conflict persists. While numerous initiatives have been proposed over the past two decades both by external actors and by the parties to the conflict, the de jure Moldovan government and the de facto Transnistrian authorities, little progress has been made to secure a more lasting peace. Click here to read more. This article analyses, the complex relationship between Tehran, Beijing and Washington on the Iranian nuclear issue. Indeed, China’ policy towards Iran has often been described as ambiguous, in supporting Washington, on the one hand, while protecting Tehran, on the other hand. In this article, we argue that, in fact, Beijing policy vis-a-vis Tehran depends on the state of its relationships with Washington. Indeed, a closer analysis shows that China is using Iran as a bargaining chip with the United States on, among others, two key security issues, i.e., Taiwan and the oil supply. The guarantee of a secured oil supply from the Middle-East in addition to a comprehensive policy of the US with regard to Chinese security interests in Taiwan as well as the use of smart sanctions against Tehran, which would thus take into account, to a certain extent, Beijing economic interests in Iran, are, indeed, the guarantee of Beijing’ support to the US policy towards Iran. Click here to read more. On the morning of 19 October 2010, Chechen Jihadists attacked the parliament building in Grozny, the capital of the Chechen Republic, in the North Caucasus region of the Russian Federation. Six people were killed, including two police officers, one parliament employee and three Jihadists. The attack took place as Russian Interior Minister, Rashid Nurgaliev, was visiting Chechnya. Also at the time of the attack, the chairman of the Chechen parliament, Dukwaha Abdurahmanov, was in discussions with a visiting delegation from the Legislative Assembly of Sverdlovsk Region (in Central Russia). The fact that the attack was timed with the presence of the Russian Interior Minister in Grozny, strongly suggests that the rebels are supported by persons from within the Chechen government structures. It is thus highly likely that the attack was planned carefully and planned from the inside. According to Igor Danilov, a member of the Sverdlovsk delegation, the gun battle between jihadists and the Chechen security forces lasted as long as one hour. Furthermore, a number of experts on the region have suggested that the attack was orchestrated under the leadership of Hussein Gakaev, a Chechen field commander who opposes the position of Chechen Jihadist leader, Dokka Umarov, as Emir of the self-proclaimed Caucasus Emirate. Gakaev, in his position of refusing to recognize Umarov’s authority, is himself supported by two other leading field commanders of the Chechen Jihad (one Chechen, Aslambek Vadalov, the other Arab). It is worth recalling that on 29 August of this year, Hussein Gakaev and his followers organized an attack on the childhood home of the current president of the Chechen Republic, Ramzan Kadyrov: the village of Tsentoroi. Taking into account these two attacks, which were seemingly perpetrated by Gakaev and his followers, we can deduce that genuine political instability continues to prevail in Chechnya at present, as well as in the wider-North Caucasus region of Russia as a whole. These unsavory incidents, and particularly yesterday’s brazen attack on the Chechen parliament, provide further evidence that Jihad has become a significant element of everyday life in this unruly region of the Russian Federation. The energy trade between Russia and the countries of the European Union (EU) is of fundamental significance for the energy security of each party. Despite the close proximity of the EU-Russia energy relationship, however, the legal and political basis underpinning this relationship, particularly with regards to the gas trade, has proven itself inadequate in guaranteeing the energy security of both parties. Russia's recent announcement of its intention "of not becoming a member" of the Energy Charter Treaty, and new proposal for global energy security has created further uncertainty. While it is hoped that a new government in Kiev will lead to an improvement of Russian relations with Ukraine, Ukraine's national gas transportation operator remains in a difficult financial position and another gas crisis embroiling Ukraine, Russia and the EU, whilst hardly imminent, cannot be entirely ruled out.